These are really, really bad! No, wait, these are really, really good! No wait....damn it, we're conflicted about this new DISH Network work sent to us from Fueld (yes, that's spelled correctly) Films. In the three commercials, comedian Frank Caliendo takes on the personas of Al Pacino, Donald Trump and George Bush. He does a fairly good job but we're not sure these commercials sold us anything. McDonald's Happy Meals Go Digital! In conjunction with Fuel Industries, McDonald's Europe is launching digital "toys" for Happy Meals through April and May. The "Fairies and Dragons" universe (for girls and boys, respectively) can be accessed via CD-ROMs inside old-school McD's Happy Meals. The campaign and associated characters are original creations by Fuel (for mommies who get moody about rampant product placement). 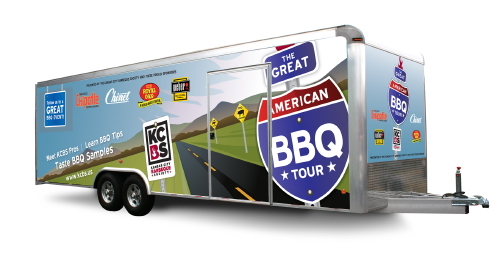 Tabasco's Chipotle Sauce, Weber Grill Creations seasonings, Royal Oak charcoal and Chinet tableware have joined forces with the Kansas City Barbeque Society to launch the first-ever Great American BBQ Tour. The sample- and recipe-packed bus will start its slow journey in Rio Rancho, New Mexico during the Pork 'n' Brew BBQ Cookoff from March 28-29. It'll visit 25 cities before coming to a stop at the Jack Daniels World Championship Invitational in Lynchburg, TN (October 24-25). See tour info and schedule. We are hungry for rib of animal drowning in spicy sauce. And maybe apple pie with Kraft Singles on top. VEGAS.com Employees Have it Good. Real Good. Aw, this is cute. Watch an apathetic VEGAS.com employee explore Sodom on a Segway. We like it best when he rejects the strawberry like it's poo. This is part of a spankin'-new VEGAS.com TV campaign called "The Vegas Experts." It cost a total of $20 million. Other spots -- produced by Stella Productions -- will follow the exploits of the Las Vegas geek squad as they go about their daily business, which is nothing like cog life anywhere else in corporate America. Featured celebrities will include The Blue Man Group, Carrot Top and Louie Anderson against backdrops like Jubilee, Fantasy, X Burlesque and Le Reve (where this ad takes place). Leave it to Copyranter to find the raciest ads out there and leave it to Adrants to share them with you. While there are literally thousands of words (we learned many we'd never heard of while having dinner with the Fleshbot crew at SXSW) to describe that particular area between a woman's legs, "box" remains one of the most popular and one of the most goofed. So, it is without surprise, the headline next to a visual of 2007's Ms. Bikini Universe Marzia Prince with a box of body strength supplement Gaspari Nutrition in front of her, yes, box, reads, "The Most Sought After Box on the Planet." What more can we say? Sometimes headlines just write themselves, don't they? Dark. Moody. Mesmerizing. Mysterious.Yes, we are attaching these descriptors to a car commercial. A Ford Fusion car commercial no less. In the commercial, we see a man drive off from the airport while a plane takes off. He then drives across land and see to arrive at the plane's destination to tell the woman he loves he forgot to tell her something before they parted hours earlier. Adding to the cryptic intensity of the spot, created by Y & R Toronto, is the fact we never find out what it was the man forgot to tell the woman. Very, very nice.